One of the more enjoyable aspects of my job as director of the Southeast Michigan Media Lab is that I get to travel to communities across Washtenaw, Wayne, Oakland and Macomb counties to present information about the media lab and the resources we offer. I call it a media lab roadshow, and I have visited Saline, Chelsea and Dexter in the last few months presenting to chamber of commerce members and at senior centers. On Sept. 13, I had the honor of returning to Milan, where I had served as editor of The Milan News-Leader from July 2006 to February 2013, while also serving as the managing editor of Heritage Media’s western Washtenaw County publications — seven in all, plus The View in Wayne County — and the website Heritage.com. I had to book it about five months out, but it was worth the wait. More than 30 people attended, and they seemed genuinely interested in the free services the lab has to offer through 21st Century Media, managed by Digital First Media, and partnering with The Milan News-Leader to contribute local news. Since my intern returned to school last month, it was a little bit more of a challenge to shoot video of my presentation while presenting. I set up a Flip video camera at a table behind me and tried to judge from afar whether I was in the frame, and I was a little off. Still, I created a video of the talk and shared it on the media lab’s YouTube channel. I also shot a Tout before the presentation started so I could use it as an example during my presentation of social media and new media tools that are available to report in real time. I fed the Tout into my RebelMouse page, which I incorporated in my presentation and told business owners it was something they should all have, if they are active on social media. In addition, I took a photo of the members getting their breakfast before my talk and included it in a Tweet before my presentation started, as another way of showcasing the greatness of social media. There were three or four reporters in the audience, and Joyce Ervin, who is a freelance writer, shared with me this morning the article she wrote for Heritage.com and The Milan News-Leader. It’s only fitting that she shared with me the link to the piece online by posting it on my Facbook page, as part of my talk was about reaching your audience on the platform they feel comfortable with and are using. 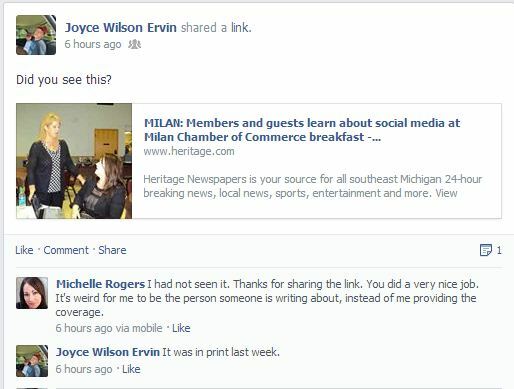 Joyce knows I am active on Facebook and would see her post there before picking up a print copy. I received some really nice feedback after the presentation and the real test of my success came just a few hours later after I shared the link to my PowerPoint with those who asked for it. 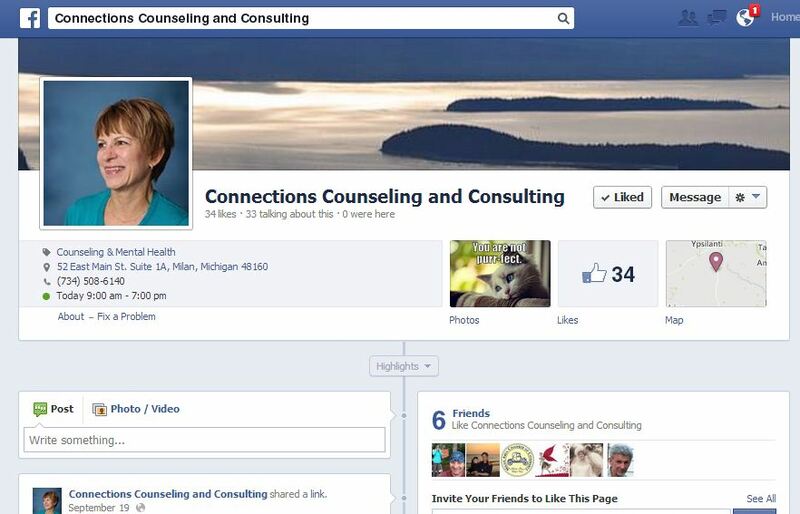 Susan Sheeley, a former elementary school counselor who just started her own counseling practice, Connections Counseling and Consulting, booked an appointment to learn more about using social media to promote her business. She had started a Facebook page, and we added her professional photo and cover photo, as well as a description. I helped her start a Twitter account and linked her Facebook and Twitter. And I also showed her how to create a meme, so she could share inspirational sayings or give advice using a new media tool. meme and Facebook post promoting her website. I also encouraged her to check out Tout and possibly set up a YouTube channel to dispense some advice, while getting people comfortable with her style and approach as a counselor. I look forward to helping more people from Milan and beyond who are struggling with social media or new media, and just need a little boost or help to get them going. It’s a bonus when they are as appreciative as Susan in her tweet. Thanks to Many thanks to @idealabheritage for helping me set up a @Facebook page and @twitter ! As I prepare to mark my one-month anniversary as director of community engagement and editorial training for Journal Register Company’s Michigan Group, I find myself questioning if I am doing enough. I’ve always been a workhorse and I’ve worked on deadline for 21 years as a former reporter, assistant editor, editor and managing editor. So, it has taken some mental adjustment to acclimate myself to a role that is more akin to a entrepreneur as I blaze a new trail in a newly created position that includes serving as director of the Southeast Michigan Media Lab. The lab, which was launched last year as part of my ideaLab project, is a training center for blogging partners, community contributors, freelance writers, student journalists and members of the community interested in learning digital media skills. I’ve spent the last month building relationships and making headway on every responsibility cited in my job description. This includes recruiting 100 blogging partners for all of our websites. Luckily, this isn’t entirely my responsibility, as the community engagement editors across our Michigan group will be recruiting from their coverage areas, as well. So far, I’ve had some success with this task, bringing on board six and I have nine others nearly ready for a total of 15. I’ve also joined the Oakland Press Bloggers and Macomb Daily/Daily Tribune Bloggers Collaborative on Facebook, and I’ve been sharing with them links to free digital tools, webinars and workshops at the media lab to help them be more successful. I also have scheduled appointments to meet with two blogging partners and the group Communities That Care to provide individual instruction at the lab. I am also charged with setting up live chats across our footprint. The first chat I have in the works is on cancer awareness, prevention and treatment, and it will be held noon March 21. I’ve lined up a doctor, cancer resource nurse, representative from the American Cancer Society and cancer survivor. Also in the works is a chat with editors representing all of our publications and websites. The chats will run on our websites across Michigan, and will allow for a text conversation between experts and our readers. These chats are in additions to the live chats I hold in conjunction with the workshops at the media lab. Also as part of the community engagement component of my position, I held a reader focus group for Heritage Media in Washtenaw County and I am working with Monica Drake, community engagement editor at The Oakland Press, to organize a reader focus group in Oakland County. This involves an online survey, PowerPoint presentation, and conversation with key communicators and stakeholders in our coverage area. At the Heritage focus group last month, I connected with school leaders in Saline and now plan to meet Friday with a group of handpicked students to gauge their interest in news-sharing and blogging partnerships, as well as their involvement in the media lab. I’ve also reached out to Chelsea schools and hope to meet soon with students there. At the media lab, I’ve been busy lining up workshops and recruiting presenters. I have four events planned in March and April on marketing blogs, search engine optimization, Google Drive and video production. Presenters include local staff, an Eastern Michigan University professor and an Internet marketing expert. Events pages have been set up on the media lab’s Facebook page. In addition, I’ve organized newsroom training on “Excel for Journalists” for all of our Michigan properties. Mark Ranzenberger, who works at The Morning Sun and teaches journalism at Central Michigan University, will provide the training, with three on-site options combined with livestreaming video and a live chat for those who can’t make it in person. I’ve also been in contact with Robin Luce-Hermann, counsel for the Michigan Press Association, to present on “New Rules for the Digital Media Age,” a workshop she delivered in 2012 at the MPA convention on legal issues relating to the Internet and journalists. Plans are also in the works to have chats at each of our newsrooms on journalists’ and editors’ use of social media to engage and communicate with our audience. I’ve also been busy seeking training for myself, logging onto the webinars “Pinterest and Instagram for Journalists,” “Overview” and “Branding for Journalists” by the Reynolds Center and Poynter, and attending training at The Oakland Press on Omniture. And for good measure and to stay active in the field, I shot and produced video of the “We Love Dexter” video launch party and interviewed Capt. Keith Colburn of “Deadliest Catch” for a podcast, both of which were posted on Heritage.com. As we end 2012 and I reflect on the successes of my ideaLab project, the Heritage Community Media Lab, what I am most proud of is the relationship we’ve had with a few regulars to our lab and their efforts to give back to us for helping them learn new media skills. Michelle Rogers, managing editor of Heritage Media West, leads a workshop at the Community Media Lab. Chris Wechner, director of marketing for The Ultimate Analyst, had this video created and posted on YouTube by someone on his team as a way of giving back to the lab. The video is an amazing promotional tool. Chris has come in for workshops on writing news releases and contributing content in visually interesting ways, and has received individual, one-on-one instruction from several Heritage Media-West staff members working shifts at the Community Media Lab. I have found Chris to be a strong supporter of the lab who wants to give back just as much as he takes. He has helped promote our workshops with a couple of blog posts. Here’s one post on his partner’s blog, ActiveRain. Chris also wrote a post after attending my workshop on his Michigan Marketer blog. Bob Cummings, a community blogging partner with Heritage.com, who writes the blog “A Look at Spirituality and Health,” is also a frequent visitor to the Community Media Lab who gives back regularly. Bob has written very supportive email messages about our efforts, and expresses his gratitude for the help he receives when he visits, as well as the value of our workshops. Joe Baublis, who is an active commenter on our coverage at Heritage.com who has also written guest columns and letters to the editor, attended my workshop, “Contributing Community Content in Visually Interesting Ways,” and created this amazing video posted on YouTube. I love that all three gentleman have so much enthusiasm for the Community Media Lab that they want to give back and support our efforts. It’s rare to find that, and to have three people with the motivation to do so is incredible to me. And I am so grateful. While their efforts have been extraordinary to me, the time workshop volunteers have donated to the Community Media Lab has impressed me, as well. Sarah Rigg, a freelance journalist and editor, has taught two workshops and just signed on to teach a third; Eastern Michigan University professors Michael McVey, Carol Schlagheck and Toni S. Jones; Eastern Echo adviser Kevin Devine; social media maven Leslie McGraw; Oakland Press photographer and videographer Doug Bauman; Oakland Press Community Engagement Editor Monica Drake; Arborwiki Editor Edward Vielmetti; Adrian College journalism professor Renee Collins; public relations professional Char Luttrell; and Ypsilanti Courier Editor Krista Gjestland have all led workshops at the lab since our launch earlier this spring. Topics have ranged from editing audio in Audacity, writing news releases, AP Style and Google Docs to Citizen Journalists and FOIA, column and narrative writing, blogging and photography. We have several workshops set for January and February, and our friend Chris Wechner is teaching a couple. Sign up on our Facebook events page, and come check out the Community Media Lab in Ypsilanti. A discussion takes place at the Community Media Lab workshop, “Contributing Community Content in Visually Interesting Ways,” Dec. 12, 2012. Nov. 4 will mark a milestone for the Community Media Lab, which is my ideaLab project for 2012. It will be the seven-month anniversary of when I launched the Community Media Lab, its blog on WordPress, as well as a Facebook page and Twitter account, to document our work, share it with the public and start a conversation about it. Since then, we’ve had more than 100 posts written by myself and our news staff, who work four-hour shifts in the lab, and nearly 3,000 page views. I was fortunate in that my project was chosen this year, along with a handful of others, for funding through our parent company, Digital First Media. We have two computers for web surfing, experimentation and blogging, and another for video editing at SPARK-East, a business incubator in Ypsilanti. We also recently purchased two MacBook Pros, an iPhone and Smart TV to facilitate our work. While the main focus of the lab is to teach technology tools and reporting skills to members of the community so they can share their voices and document the important events, traditions and news in their communities in partnership with Heritage Media, we also want to reach out to nonprofits, businesses and individuals to help them feel more comfortable using technology. The Community Media Lab is still a work in progress. I am pleased with everything we have accomplished so far. From hosting a couple dozen workshops on everything from writing press releases and working with local media to choosing the right blogging platform, using social media and editing audio for podcasts, we’ve had the pleasure of working with a number of local educators, professionals and experts in various fields. We have livestreamed their workshops using uStream and a webcam on our Netbook, and simultaneously hosted live, interactive chats using CoverItLive to engage our online audience. We have also posted our presenters’ PowerPoints using Scribd, and promoted their workshops on our website, Facebook pages and through Twitter. While the efforts we make associated with hosting workshops in the lab are fun and professionally rewarding, as we use new technology to connect with our audience, working one-on-one with the public is personally rewarding for me. For example, I helped a business owner set up a YouTube account so she could share product demonstration videos. She had hired a professional videographer to create the the videos, but wasn’t sure how to get them in front of an audience. I walked her through the process of setting up an account for her business on YouTube and uploading the videos. I also worked with a senior citizen, who didn’t feel comfortable with technology, to set up a Facebook account to communicate with family and friends, and an account on Craig’s List to sell a car. Both were grateful to receive individual instruction and afterward felt more comfortable using technology. Last week, a freelance journalist, who feels more comfortable putting pen to paper, attended one of our workshops on blogging and decided to take the plunge. It was rewarding to see her take baby steps into the digital world and begin her journey as multimedia journalists. We set up an account on WordPress and she plans to write about social injustices. Once she gets started, I’ve encouraged her to share her work on our blog roll at Heritage.com. There is still so much more to do, though. Our Community Media Lab isn’t widely known. I’ve had business cards created so reporters could pass them out at meetings and events, I’ve created fliers promoting our workshops, and recently I was a local “celebrity” guest at a business opening in Ypsilanti, where I was given the opportunity to promote the lab. My plan is to do more community outreach and take our lab on the road. Community Engagement Editor Erica McClain and I would like to present the Community Media Lab Roadshow, visiting chambers of commerce, senior centers, teen centers and schools across Washtenaw County, educating people about the lab and how we can help them. Beyond promotion, I’d like to recruit students interested in writing, photography, videography, podcasting, social media and animation. The Community Media Lab can serve as a training ground for them, with their work shared on our website and some repurposed for print. If you know of any students who may be interested, please put them in touch with us through our Facebook page or have them stop by our lab at 215 W. Michigan Ave. in Ypsilanti. In the meantime, we will continue our daily efforts in the Community Media Lab, with a journalist or editor there between 9 a.m. and 4 p.m. Monday through Friday working with individuals, experimenting with technology or reporting and editing, and hosting regular workshops free and open to the public. After all, practice makes perfect. Kent County Sheriff Lawrence Stelma, Blue Cross Blue Shield of Michigan Director of Corporate Affairs Helen Stojic, Fennville High School basketball coach Ryan Klinger and Grand Rapids Mayor George Heartwell talked about what it’s like to “deal with the media” and the Jan. 27 Michigan Press Association conference in Grand Rapids. It was billed as a way to get “pointers from a perspective that can yield better stories for newspaper readers.” It was moderated by Ron Dzwonkowski of The Detroit Free Press. The face and the voice of City Hall is interpreted for its citizens through print and electronic media, said Heartwell. “When I get calls … I direct them to the right person to help them out,” she said. Stojic said she runs into people who say they wouldn’t want her job because she has to “deal with the media.” But she thinks it’s important to be proactive and keep reporters informed. She was asked if it’s her job to make BCBS look good. She said it’s her job to tell the company’s story and there’s a lot of misinformation out there, like on the Internet, that they have to counter. Stelma asked if he always tells the truth. He said he does, but often media has a tip or information and they know he knows, but for some reason the sheriff can’t reveal the information at that time. “I just tell them I can’t devuldge the information at this time. “I can tell them, but they know. … It’s the balancing of what information is important to the community for safety reasons. Mayor Heartwell asked if he always tells the truth. He was bound one time by a nondisclosure agreement to not talk about a project in the city and he said he would never do that again because he needs to work in public’s best interest as a public servant. He often says he can’t comment, and would not lie. Heartwell said he often gets his first knowledge of an incident from the media, rather than from his own police force because they’re busy on the case. When asked for comment, he doesn’t like to admit or tell the media this is the first he is hearing about an incident in the city, but he understands why he’s placed in that position. Stelma said he often gets caught up in the media’s frenzy to get the story out first. “I actually get involved in the tension of the media (battling for the story).” He has a media line and encourages reporters to call that line, which is answered regularly. He does not share his cell number, but he does share email address. Stojic said an employees sometimes circle a story in print and tell her how the reporter got it wrong. She says she always tries to get it right and it’s rare her boss or an employee points to anything she got wrong. Stelma doesn’t distinguish between media and citizens in covering story pr shooting video or photos. Sheriff Stelma doesn’t go off the record with reporters because it’s more trouble than it’s worth. Stojic says she has gone off the record to give background on a topic to a reporter when doesn’t want to give official comment just yet. “We want to make sure the information is correct,” she said. Editor’s Note: This post features notes from a conference and has been generated live, so please excuse the choppiness. Stefanie Murray, former AnnArbor.com social media and engagement guru, now director of digital audience development for The Detroit Free Press, and Jerry Sova, who is responsible for many of the online components at The Jackson Citizen Patriot, covered what is social media, why news organizations are using it, what it takes in terms of resources and skills, getting started, going further with it and tips on using it. Check out the first hour of audio on my phlog. Digital communication turned into an interactive dialogue, user-generated content sharing, conversation. Wikipedia, post links to stories and updates for local officials, communities. Six different types of social media: Wikipedia, Twitter, YouTube, Facebook, World of Warcraft and Second Life. Facebook has 800 million-plus active users; People in Australia most active. Twitter has 100 million-plus active users and Google+ has 50 million plus. Online content sharing services are also social, like YouTube, Flickr, Instagram, Tumblr should be part of your strategy; others come and go frequently, such as FourSquare, Linkedin. Our audience is on social media. They are talking about our stories, our communities and what’s relevant to them. We, as journalists, can engage them and become part of the conversation. Social media allows you to interact with your audience. It allows us to find sources and stories, talk to readers, share our content, grow online traffic, and social media can be used for customer service. At Detroit Free Press, Murray works with web department to monitor Twitter accounts, traffic and interactions. Mentions on Twitter for customer service problems are forwarded to appropriate department. Customers Tweeting customer service problems. Murray says both reporters and editors should be using social media to engage the audience. Train your staff on social media. Don’t assume staff knows or should figure it out on their own during their personal time. Murray suggested media organizations buy ads on Facebook to promote publications and also provides important insights/data/metrics. Stressed use of Metatags. Facebook tracks how many people are going to your site. Murray said if you make it clear you’re asking on Facebook for content, then it’s OK to use it. Be clear on your intentions as you interact with the audience — ask in comments section or private message. Freep posts a lot of photos on Facebook. Readers like to share them. Post a photo and link to photo gallery because Facebook retains right to use them in another format, Murray said. New metric on Facebook shows how many people shared a post. Number of shares important. Let’s you know how many people posted it on their Facebook. Important to know how readers interacting with your domain. Can achieve this with Metatag. Check http://wwww.Facebook.com/insights. You will see pages and websites for administrator. Need to tell website and Facebook talking to each other to get it going. Facebook doing away with pages for people. Instead, you can subscribe. More valuable to Facebook. Facebook didn’t want a person/profile fractured, so no longer offering personal pages. Will have subscriptions. This could be important to us as journalists. Journalists choose on drop-down whether to post public or private. Can gain subscribers sharing publicly and drive more traffic to website sharing work. Facebook will suggest who you may want to subscribe to on the left side of your profile page, “People you may want to subscribe to.” Facebook offers name and what they do for a living. It’s important for journalists to say what they do to gain subscribers. You will gain readers and sources as you subscribe to people and people subscribe to you, and you will show up on others’ pages. Subscribing is the same thing as being a “fan.” Subscribers are like “fans” on Facebook or “followers” on Twitter. Murray said you can’t currently get analytics on personal pages, but will soon. You can decide to make public or allow friends to see it or customize it. Murray suggests all reporters and editors allow subscribers on personal pages and then choose what you want to make public. Can unsubscribe people who you have who aren’t necessarily friends and convert them to subscribers. Murray: Facebook ads available for promotions and contests. Use an approved application, instead of posting on wall, “Like us and you could win tickets.” Woobox and Wildfire apps will create ad. Can get a monthly subscription for $30. Jerry Sova of Jackson Citizen Patriot talked about “liking” businesses on Facebook, offer to share their photos and establish a relationship. Ask if you can post links on their FB pages and share audience. Sova suggests getting referrals and more fans having FB news feed on homepage of website. Tease them to the Facebook page with a news post on website homepage. Contests and giving away prizes can help you get more fans. Murray recommends 45 minutes to an hour between FB posts. Bigger audience on Facebook at night. Murray recommends Wednesday as best engagement day between 9 and 11 p.m. Using third-party applications are given less importance on FB. Post manually for better results. Murray, highest retweet between 2 and 5 p.m. Send out multiple Tweets on Twitter if it’s an important story because Twitter moves so fast. Fans may miss it. Twitter and Facebook two different audiences. Don’t assume same. Sports has huge following on Twitter. Make sure to follow athletes and Tweet and retweet to following. People want to talk to people on Twitter, not necessarily brands. Encourage reporters to Tweet their stories and retweeting. Assign reporters to either use corporate account or personal account, or both. Make sure they’re operating as a reporter at all times. The second half of today’s talk on social media can be found on my phlog. The alarm sounded at 4:15 a.m. this morning, a lot earlier than most days. That’s because I and four staff members had signed up to attend the Michigan AP Editorial Association Annual Editors Meeting in Mount Pleasant. An hour to get ready, 30 minutes to get to Saline and a two-hour-plus drive and here we are — at the PohlCat Golf Course Clubhouse with about 45 journalists. Armed with Netbooks and smartphones, we’re all eagerly awaiting the first session: “The Nuts and Bolts of Social Media — What It Takes and How You Get Everyone Started.” It will be presented by former AnnArbor.com social media guru Stefanie Murray, now director of digital audience development for The Detroit Free Press. 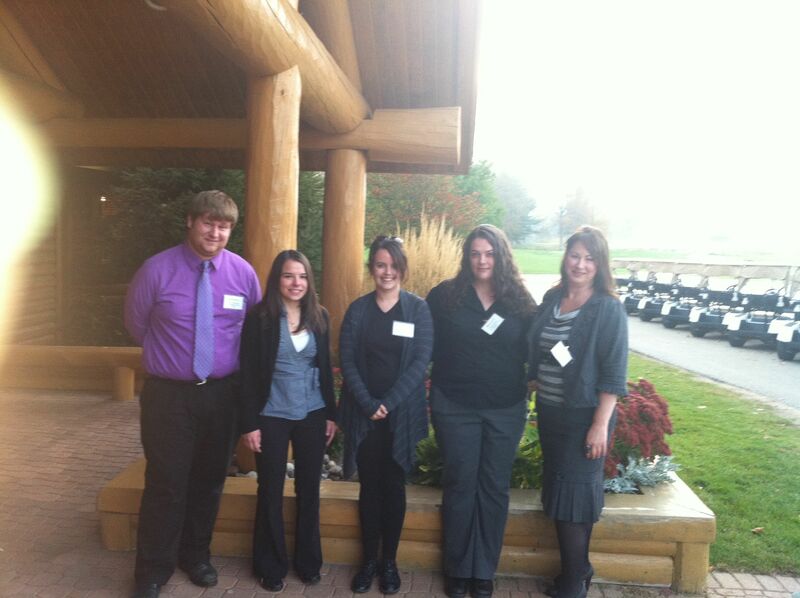 Look for my next post on her talk, which is set from 9 to 11 a.m.
David Veselenak, Tanya Wildt, Amy Bell, Erica McClain and Michelle Rogers outside the PohlCat Golf Course Clubhouse in Mount Pleasant for the Michigan AP Editorial Association Annual Editors Meeting. Poll: Do you know someone with kidney disease? Bloggers, surveys, Touts and media lab presentations — Oh, my!